By Clare B. Dunkle. San Francisco: Chronicle Books, 2015. Companion memoir to Elena Vanishing. Over the years, my worst fears for my daughter have crystallized into a terrifying daydream, a daydream so frightful that I have never told it to a single human being until now. My daydream is this: I am receiving The Call. A voice is saying, "I'm so sorry. It's about your daughter," and I continue to hold the phone, but I can't hear anymore. It doesn't matter. I already know what the voice is going to say. When novelist Clare B. Dunkle's seventeen-year-old daughter, Elena, is diagnosed with anorexia nervosa, Clare's first reaction is one of bewildered disbelief. Elena is a top honors student at her high school in Germany, a regular volunteer at the nearby military hospital, and a beautiful, cosmopolitan girl confident in two cultures and two languages, who never gets into trouble. But what at first seems like an arbitrary and inexplicable diagnosis quickly escalates into a nightmare. As Clare struggles to make sense of conflicting information from doctors, therapists, and Elena herself, she comes to accept the terrifying truth: Elena does indeed suffer from severe anorexia nervosa, and she may be only weeks away from dying. What follows is a compelling and heart-wrenching view of a child's mental illness as a parent experiences it: the contradictory and sometimes condescending opinions of experts; the confusing, frustrating, and endless health insurance battles; the cross-country travels for hospital and rehab visits; and most of all, the agony and helplessness of watching a child destroy herself. Underlying everything is a woman's struggle with her identity as a wife, mother, and writer. But Clare has a unique weapon against the forces tearing her family apart. "When I have a question I can't answer, I write a story." And so she agrees to help Elena document her illness in a memoir. In the process, she turns her own daughter into a character on the printed page. It may be Elena's only chance at a happy ending. 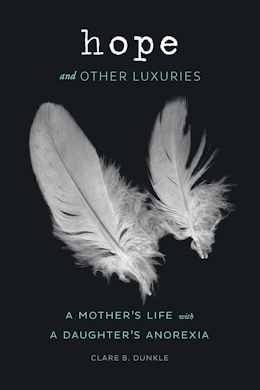 Brave, beautifully written, and unflinchingly honest, Hope and Other Luxuries is an unforgettable memoir of one family's fight against a deadly disease—and a testament to love in its purest form. Buy HOPE AND OTHER LUXURIES in hardcover. Buy HOPE AND OTHER LUXURIES in Kindle edition. One of Stylist Magazine's "Four Books That Changed the Conversation." "Harrowing and exhausting, heart wrenching, and revealing." One of Conversations Magazine's Top 100 Adult Books of 2015. Featured on the Diane Rehm Show. Jacket art appears courtesy of Chronicle Books.